Could It Be??? Looking For Chupacabras Answers. In examining, as I have for the past two and a half years, the Chupacabra/s phenomenon in Puerto Rico (where inarguably the legend originates), I have stumbled upon several possible, if remote, candidates for the startling and altogether unusual creature witnesses have seen. Perhaps, coupled with an exaggeration born of excitement, these nonetheless fantastic creatures (amazing discoveries in their own rights) may have been confused for something even more amazing. The Puerto Rican Sloth (and its ilk) were prevalent throughout the West Indies until 3,000 to 4,000 years ago. Ranging from 10 - 30 lbs, possessing a "spiny" coat, and mostly arboreal, this sloth in many ways fits some descriptions of the Chupacabras. Large rodents, collectively known as Hutias, were also prevalent throughout the Caribbean. The largest of these rivaled in size that of a North American black bear. These larger ones were long since lost to the fossil record, but smaller specimens - around 15 pounds and about the size of large cat - existed until the inception of the Spanish Colonial period. Most of these species resembled the capibara, the largest extant rodent known to science. Still even smaller Hutias, which are still larger than your average rat, are hunted for food on nearby islands such as Cuba. Hutias aren't currently known to exist on Puerto Rico, but if any relic species of these echimyidae, or spiny rodents, - in whatever size - still existed in hidden enclaves throughout the island's remoter corners, then perhas this could explain sightings as well. This spiny fur, coupled with their oddity and arboreal proclivities would, too, fit witness descriptions. Currently, I am working on examining further these creatures and others as possible explanations for what we now term as the Chupacabras, and will publish much of these reports, as well as other tales, in a forthcoming work on the mysteries of Puerto Rico. This volume will be similar in format to that of Strange State and will likely be available through cafepress.com. A quick trip to Home Depot will have you scaring friends and neighbors in no time - not to mention all the fake ghost pictures that will be posted on the Internet. It's a surprisingly simple and yet effective illusion. I think doing these could be the next Flat Stanley. ¿Después del sensacionalismo (de que los reporteros latinoamericanos parecen tener una abundancia) se desploman, los fanaticos de MonsterQuest, etc… serán dejados parecer tontos otra vez? Perhaps, I'm feeling a degree of burnout, but I must say it all just becomes so tiresome after a bit. Although, if you read the comments thereafter (the link above), I must say Praetorian exhibited a modicum of intelligence. Thank god! I do apologize for not posting more lately. I've been simply swallowed up by a combination of fiction writing and working on the follow-up to Strange State. I had meant for it to be far closer to completion at this point, but as I'm sure many of you know... things get in the way (not the least of which was an upper respiratory infection). So, I'm slowly getting back into a routine and piling up my desk with a short story project, the ever-elusive novel, and this forthcoming sequel. I hope by the end of August, I will have the latter up on cafepress. I've received a copy of another project I helped with that was sold on the site and I must say, I thought the quality was altogether not bad. 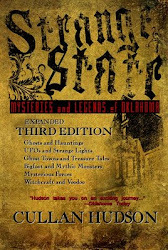 Additional copies of the first Strange State will be available soon. And I will try my hardest to post more on the blog. If any of you out there would like to contribute to this site, I am more than happy to get some new voices on here to help keep both the site and its content fresh. 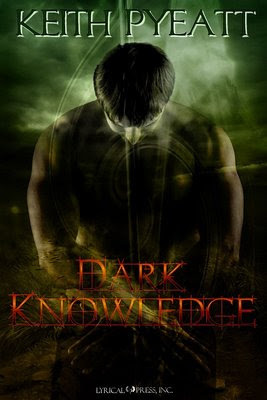 Check out author Keith Pyeatt's forthcoming work, Dark Knowledge. You can read about it and also check out his supernatural thriller, Struck, which is now available. Todd, along with Klass and Pflock, access military files of such depth (200 pages) they include evaluations, despite this being a clear violation of the US Privacy Act of 1974. This act requires written permission from the living veteran before such records could be obtained. Nowhere is there any record of Marcel providing this written permission. A lawyer was asked “which would take precedence in a conflict between a FOIA request and the Privacy Act?” Marcel died in 1987 and this Privacy Act is the same law that insures that the US Census Records are not made public until 75 years after the fact. Therefore, the records of Marcel’s military service should have been sealed for the same period. The National Archives Personnel Division has enough trouble just fulfilling the requests for ordinary servicepersons records (a fire destroyed many, many such records in the early 1970’s). Hundreds of families doing research into their own family find that the records of their veterans service has to be cobbled together from tiny facts gleaned from insurance records or other duplications. They are often merely entry-exit dates, location of service, and grade of service. Interestingly enough, the USAF has a website devoted to the Privacy Act. Somethings really make a person go, huh? Robert Todd discovers the real cause of the largest and most culturally relevant UFO case in the later part of the 20th century and he “discarded most of his files”? He doesn’t publish in “mainstream” media. He doesn’t get a book deal. He had invested a large part of his life, so Klass said, to the search for just such truth and resolution of mystery. Yet…he discards it. This goes against human nature in so many ways and underscores the mystery surrounding this portion of the bizarre history of UFOs. Components (from the USAF and other reports):Various claims as to the physical nature of the actual experiments have varied, ranging from 25 balloons, to 600 foot long balloon “trains”. Without better data it is difficult to determine if these may be referencing the same description using different terms. Note: None of these components were classified. In fact just prior to Roswell a farmer in Circleville, Ohio found just such a balloon and it appeared in the local paper. What is claimed as top secret were the specific combinations of these elements (including a radiosonde microphone and constant level high altitude balloons). “Cluster of (meteorological) balloons” – twenty-five 350-gram balloons spaced at 20 ft. intervals (a typical balloon used a single, 350-gram neoprene balloon and a radiosonde housed in a cardboard box). Black “cutoff” box containing portions of a weather instrument. (A FBI note of July 9, 1947 lists a “hexagon”, or six sided item thought to be a standard Rawin radar target (Kevin Randle, E-mail 21 May 2001). For more information on the pros and cons of the Project Mogul explanation, I recommend this scientific report, An Engineer looks at Project Mogul http://www.cufos.org/ros4.html and this is the official "skeptical" version, Roswell and Project Mogul http://csicop.org/si/9507/roswell.html . An illuminating article that raises many, many questions can be found in Sheridan Cavitt and the Roswell Debris http://kevinrandle.blogspot.com/2007/04/sheridan-cavitt-and-roswell-crash.html. Anyone who has read the debunking or criticisms of Major Marcel should read this and then research the news reports from 1947 looking for Sheridan's name. It can be interesting reading. Sometimes in research it is best to plod through the modern verbosity and head right to the source. A novel idea, but one so many seem to avoid. 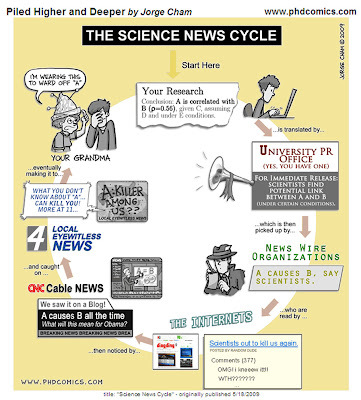 So what was said in those early days, other than the well documented Marcel, Blanchard, etc. ? Since it my blog - read the comments after each. FBI Teletype dated 7/6/47“an object purporting to be a flying disc as recovered near Roswell, New Mexico, this date. The disc is hexagonal in shape and was suspended from a ballon (sic) by cable, which ballon (sic) was approximately twenty feet in diameter. [blacked out] further advised that the object found resembles a high altitude weather balloon with a radar reflector, but that telephonic conversation between their office and Wright field had not [blacked out]borne out this belief. Disc and balloon being transported this office because of national interest in case,…no further investigation being conducted.” It would be very interesting to see who advised the object looked like a balloon. What office communicated with Wright? Roswell Daily Record, July 8, 1947, “Roswell Man and Wife Report Disk Seen”“Mr. and Mrs. Dan Wilmot apparently were the only persons in Roswell who saw what they thought was a flying disk…..a large glowing object zoomed out of the sky from the southeast, going in a northeasterly direction at a high rate of speed…it was in sight less than a minute….in appearance it looked oval in shape like two inverted saucers, faced mouth to mouth…. (http://www.grassyhill.com/Roswell/Articles?pressReports.htm accessed 5/5/2001). Note the speed, direction, and behavior - do these jibe with Project Mogul? Ceylon Observer, July 9, 1947“Flying Saucer” over S. Africa, Canada and Austrailia?A Reuters report indicated that 41 states had reported mysterious objects….and they had been also seen in Canada, South Africa, and Australia. Witnesses saw silver “donuts” and objects in a v formation and some that glowed. Note that these balloons must have really gotten around, especially since there were only 10 flights in Project Mogul. Roswell Daily Record, July 9, 1947, “Harassed Rancher who Located ‘Saucer’ Sorry he told about it”“Brazel said that he had previously fund two weather balloons on the ranch, but that what he found this did not in any way resemble either of these. “I am sure what I found was not any weather observation balloon, “ he said.” The farmer had previous experience with balloons - the components were basically the same components as evidenced by the Project descriptions -so what was so unusaul that Brazel, once he heard reports of flying discs, thought he should report it? Las Vegas Review, July 8, 1947 a UP story reported that the Army and the Navy “began a concentrated campaign to stop the rumors” and that as a result flying saucer reports “fell sharply”. A little reactionary is it? They had the cover, balloons, but they now felt a need to clamp down on it? Life is filled with irony. Philip J. Klass was the thorn in the side of just about everybody according to most reports. It is little wonder than that this poster child of debunkers, masquerading as skeptics, should have an FBI file. In 65 pages of reports, memos, and photocopied articles are revealed a fascinating dark side to this man who was often not above personal, and very ugly, attacks on UFO researchers. The file, located at http://www.cufon.org/cufon/Klass_FBI.pdf, notes that by the early 1960's there was an official FBI file on Klass for a 1953 article that revealed classified information. The Air Force was quoted as saying that one article dealt with something so classified that it could not be declassified for purposes of a lawsuit! In 1975, the FBI noted he had been twice investigated for publications of classified information and for his attacks on the character of Dr. J. Allen Hyneck. His books are noted for their ability to track down and eradicate a non-issue as if it were the main event. To ignore facts that did not conform to his views. His lasting legacy is a warning to future researchers and a footnote on the willingness for those who claim to be skeptics to be at heart agenda driven debunkers. A memo of that year from the FBI's Mr. Kein to Mr. Moore states: "In view of Klass' intemperate cricitism and often irrational statements...we should be most careful in any further contacts." In another place, an agent in 1976 questioned if Klass was in "possession of all his faculties" regarding a 28 page rant that included terms such as "psychic time bomb", "Jewish subconscious transformation", and a device called a "cattle-prod prod" to be used against enemy aircraft. This is the Klass who was a founding member of the Committee for the Scientific Investigation o Claims of the Paranormal (CSICOP). He was called by Michael Sokolove 'the voice of cool reason". In 1983 he published his famous "UFO Curse" ..."you will never know any more about UFOs than you know today." Yes, there sounds the bell like voice of a mind that has closed its corridors to anything but what it firmly believes to be truth. Klass, High Priest of Debunkers and Close-Minded Scientists, died in 2005. Anyone who has delved deeply into the whole Roswell saga, has come across several names: Jesse Marcel Sr., Philip Klass, Karl Pflock, and ubiquitous kudos to one "Robert G. Todd". Robert Todd was, according to the late Phil Klass, the Grand Master of UFO Debunks, a “believer in his younger days", a "sharp-eyed researcher" who pioneered using the Freedom of Information Act (FOIA) to uncover information and who stated the USAF in its report data, possessed an "encyclopedic understanding of military records" (something hard enough for people with a strong military background - or, so military types tell me). Todd, along with Phill Klass and others, came to represent all the aspects of Roswell that caused people to say, “something doesn’t add up”. They symbolize the intuitive awareness felt by many that some things in the explanations simply did not add up. The entire later half of the 20th century was comprised of a series of "preemptive hoaxes" apparently designed to undermine any possible valid information surfacing regarding UFOs or Roswell's famous crash. Consider for a moment, 1) Roswell begins to re-surface after several decades of being a faint rumor or totally forgotten and behold the MJ-12 documents surface and there is the haggling over its authenticity, 2) Roswell gains credibility through congressional investigations spearheaded by New Mexico politicians and the MOGUL explanation surfaces (aw, gee shucks, ma'am, I don't know how I forgot that top-secret project....), 3) yet Roswell continues to be considered seriously by too many people and the notorious "Alien Autopsy" film surfaces... even if this time line is off - search and you shall find the same "counter-moves" being made repeatedly to block potential credibility or serious investigation. Yet, questions remain unanswered, even after all of these years. The Cryptomundo post, "Bringing Weird To LA" , makes me wonder if that's like bringing water to the sea. And for all those naysayers and paranoid conspiracy theorists who denounced the factuality of any moon landing, this brief at Phantoms and Monsters will probably.... Well, you probably still won't believe it. 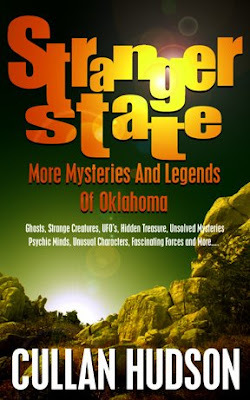 Doing a lot of last minute research in preparation for the release of Stranger State, the sequel to the ever-popular Strange State: Mysteries and Legends of Oklahoma. If you have a personal account of the bizarre and would like to see it in print, I've still plenty of room in which to squeeze some more great details about Oklahoma spirits, UFO's, monsters, and just plain weird tales. In this CNN report, it is being argued across the internet, one can see an apparition cross a hallway at the 08:22 minute mark. While a more thorough examination of the hallway would be needed (for example, is there actually a glass partition or such wherein a passing figure could be reflected), it remains a nonetheless intriguing find. Assuming this video hasn't been tampered with (I'd like to compare the original CNN video) prior to posting on YouTube. So far it has been very difficult to find this same footage on CNN.com, but that's often a problem of CNN. When I can track down the original, I'll post an update based upon what I find. There's also this Anderson Cooper report that some are claiming also represents the King of Pop's specter, but I think since this is on a monitor in the background, it's simply a brief video image that is dark and out of the camera's focus range. A second after it fades you can see a white line at the top of the monitor, as if it were gearing up to run a video. At around 2 a.m. on July 4, 1977, a woman and her eight year-old son were driving south on I-35 between Oklahoma City and Moore when the woman saw what she described as a “revolving restaurant” traveling across the sky. Later, when relaying the account, both mother and son drew the same disk-like object, traveling at an angle [from Strange State: Mysteries and Legends of Oklahoma]. 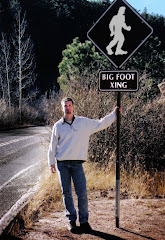 On July 4, 1969, Eldon Brackett spotted a 7½ foot tall Bigfoot north of Wildwood, CA. The creature left behind 16½ inch tracks with a 4 foot stride. A group picknicking on Independence Day, 1947 in Smoke River Canyon, Idaho, spotted dozens of disks in the sky. 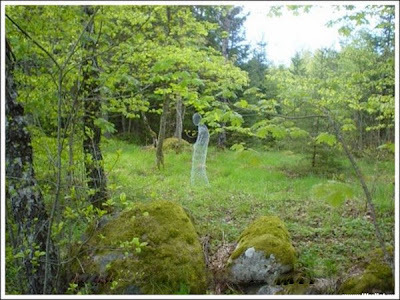 This was just one of the more than 90 sightings by hundreds of people in 24 states that was reported that year. July 4th was the height of the '47 UFO flap. Only the day before, rancher 'Mac' Brazel discovered debris on his ranch north of Roswell, NM. The Constantine Theater in downtown Pawhuska once having hosted Vaudeville acts, silent movies, operas and original showings of movie classics such as “Gone with the Wind,” is now said to host ghosts. In fact, it is one of the top haunted sites in Oklahoma. People have reported hearing the sound of opening and closing doors, footsteps going up and down the stairs and once reported was a mist seen drifting in the crawl tunnel underneath the theater’s stage. Because of the strange experiences at the building, it has been investigated a number of times, with some of the investigations resulting in recordings of footsteps, a gunshot followed by a gasp and laborious breathing. Originally built around 1880 as the Pawhuska House Hotel, the building was purchased by Greek immigrant Charles Constantine in 1910. He then renovated the building and turned it into the theater it is today. “The first time we came here we walked in and we go, ‘Wow!’” said the co-founder of Northeast Oklahoma Research, speaking of the elegant Greek d/cor of the theater. He identified himself as Dustin and refused to disclose his surname to the Journal-Capital. Dustin and his team of investigators from N.O.R.S. conducted an investigation on the theater on May 23 and from 7:30 p.m. to 1 a.m. took approximately 40 hours worth of video and audio recordings focusing much of the equipment on the stage where most reports of paranormal experiences seemed to have their source. N.O.R.S. returned to the theater Saturday evening to present their findings. to the public. He said the team did, however, have some findings but the events didn’t seem to occur on the stage as they had anticipated. Rather occured around the boardroom. He said the video evidence, although capturing some dark movements and shapes was overall not so impressive, but that rather it was the audio that was especially interesting. He played audio clips of odd whooping, whipping sounds, and then later a knocking or tapping sound. Then he played a recording of a whisper from what sounded like a male saying “Where is she?” He said the team members before the investigation agreed to speak at normal tones during the recording and if they accidently whispered, to tell the other team members and to log the instance so as not to mistake it as a paranormal event. Dustin told the group at the presentation that he later learned a gentleman by the same name worked for Constantine from 1921-1923.